Mom of Many Words: A picture is worth a thousand words.. and one meltdown. A picture is worth a thousand words.. and one meltdown. My car hates Pennsylvania. In the same way business travelers hate Chicago O’Hare Airport, or the way that I hate the mall (you heard me), my car seems to detest traveling through the Keystone State (yes, that is Pennsylvania's nickname - don't ask me to explain). Last weekend was Family Weekend at Second Born’s college. Spouse and I planned to get there early enough Friday to spend the whole afternoon with our kid (all I had was Skype since August, I was long past due). We left work early Thursday to get a chunk of the trip done, and made it just over the Delaware River to Matamoras, PA before we stopped for the night. We figured if we hit the road by 10 the next morning, we would get to our destination by or before 1 p.m., and we'd have the whole afternoon and weekend with her, which would make me very happy. The car, however, had other plans. We had only put about 30 minutes behind us Friday morning when the car began losing power with each incline. I should mention there is no shortage of inclines in Pennsylvania. All of a sudden our vehicle emitted a loud BANG that startled us both. Spouse slowed down and pulled over to the emergency lane, flashers on. We crawled along I-84 hoping to make it to the next exit, not that there was a sign for an exit anywhere in sight. Here's the irony, and proof that my car has an aversion to traveling through Pennsylvania (we once had a car that hated New Jersey, but who could blame it?). A year and a half ago the car’s transmission decided to seize on the same trip, within a few miles of our current spot. At least it had the decency to so do within a half mile of a garage that day. A few minutes later, on the side of the highway in Not-on-the-Map, Pennsylvania, the car took its last breath. My first call was to Second Born’s Best Friend’s parents who left Maine for PA that Friday morning. They were a couple of hours away and very kindly offered to be our backup ride if we needed it. Ironically, since we had to wait for our car, they arrived long before we did at the school by leaving home 18 hours later. Sigh. My second call was to AAA roadside service. After being transferred twice - the first time from the main number to a PA AAA, then to a PA AAA that had actually heard of this area - the operator asked what our exact location was. “Mile Marker 12.8 on I-84 West!” Seriously, that was all I had. There was nothing else to identify the area. 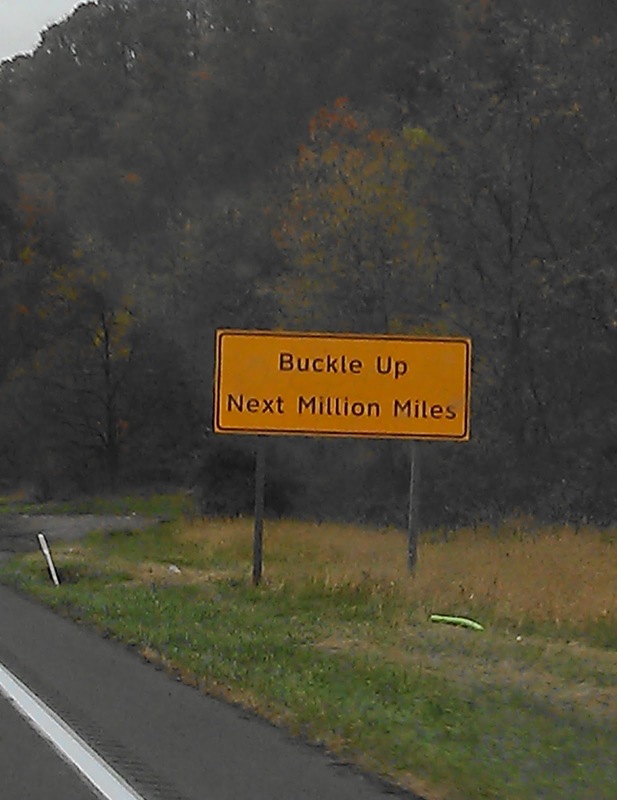 I took a photo of the sign - there was that fleeting thought that this may be the last place anyone saw us alive. When the tow truck driver finally reached us we realized why it took him an hour to arrive. That dilapidated truck couldn’t move more than 35 mph, I believe to avoid shattering into little pieces on the road. Spouse and I were practically gripping whatever we could (except the seat belts - they were so disgusting that clouds of some unidentifiable substance floated by when you touched them). Somehow it delivered us to Sears Automotive in the Scranton area in one piece, more or less. We had already lost an hour and a half by then. Usually I am the calm one in these situations, commenting that the fiasco at hand will provide me with plenty of material. But having to tell Second Born we wouldn't be there any time soon, after sending her a text that we'd be there in a few hours just before the car hit rock bottom, sent me into a tailspin. Spouse started to joke that I should shed some tears to coax the mechanic along… until he realized the tears were freely flowing, in the car, in the garage waiting room, any time I let myself think about the delay and how much I've been missing my girls. I knew I had to shake myself out of this state of mind before it made me feel even worse. I started taking pictures with my cell phone. 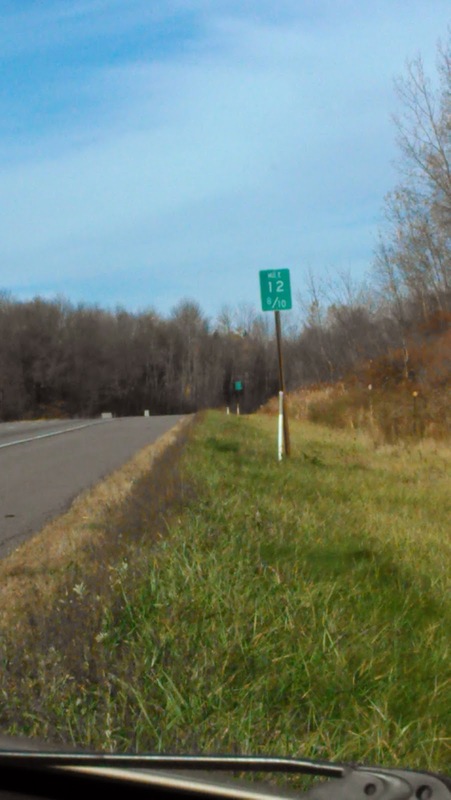 I already had my classic mile marker photo, so I had kind of a head start. In the Sears waiting room I snapped one of this. Why? Because I tried to drink out of it and it brought me right back to bad elementary school memories. 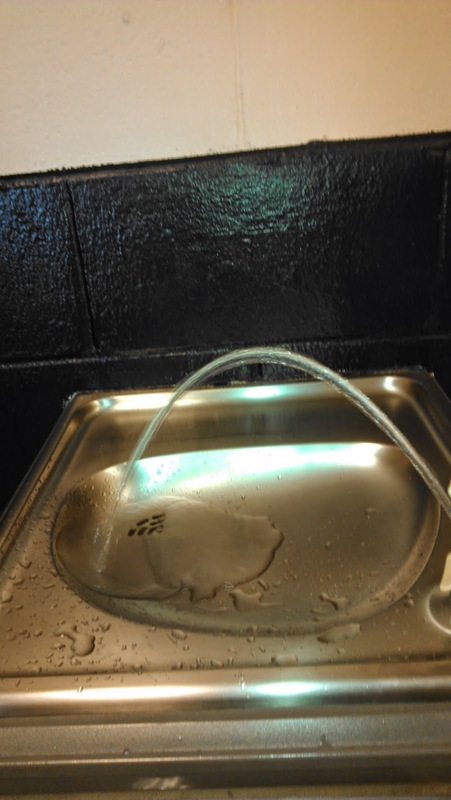 How ridiculously designed are water bubblers? Do you know anybody who can drink from one without sticking out their tongue like a labrador, slurping like they hadn't had water in weeks and getting their favorite vest that Gramma hand-knitted soaked in the process? And when was the water in these things ever actually cold?? A man who reminded me of a castoff from Duck Dynasty had wandered into the waiting area and changed the television station to a disastrous show called 1,000 Ways to Die on Spike TV. You would think that should be reason enough to seek other entertainment, right? But no, I was annoyed that he just commandeered the remote so I coaxed Spouse into doing what we do so well (and which has almost gotten us kicked out of theaters). Heckling. This show was beyond heckle-worthy, seriously. Eventually we got bored with the bad puns and watching idiots like the bride who overdosed just before walking down the aisle and collapsed, or the cheating moron who went blind while tenting with his girlfriend and got eaten by a bear. These are clearly signs of a gene pool in need of cleaning up. 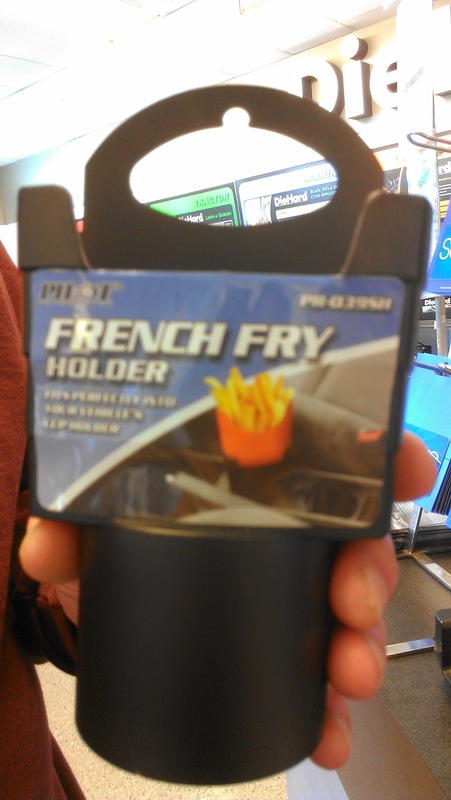 We wandered back into the store where Spouse found, among other treasures, a vital accessory for any car - the french fry holder. Back on the road a few hours later, I took photos of strange road signs on our way. Pennsylvania has some interesting ones. This one is a nice thought but a little excessive, I think... what if you need a rest stop? So should we be watching for and reporting cars we see weaving in and out that seem to be driven by someone under the influence? Or did you just give a college student permission to open a 6-pack? "Hey guys, we're finally here - crack that baby open." 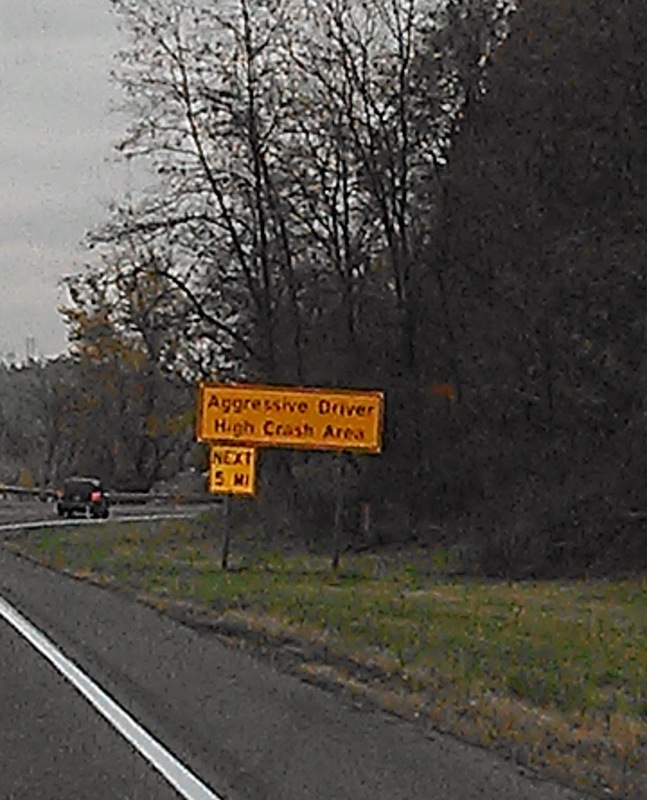 Aggressive driver high crash area - really? Because I'm not paranoid enough about my kid being 9 hours away in a college town! But my favorite photo of the weekend is right here. 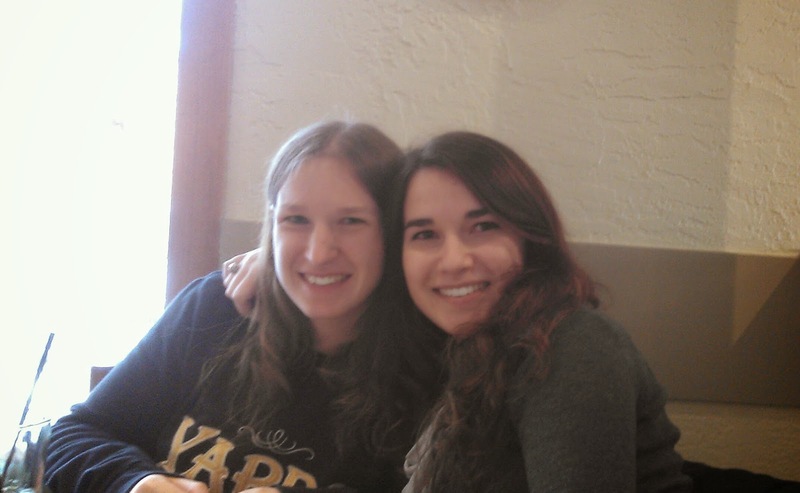 First Born and The Fiancé surprised her sister on Saturday, and our gang spent the rest of the weekend together. It was perfect. It could have been much worse. The car may have decided to bite the bullet on a dark highway Thursday night, or in the middle of the many construction zones with one-lane Jersey barriers we came across. So despite an uncooperative automobile, I put aside the car-tastrophe and enjoy every moment of our short reunion, once I “snapped" myself out of it (I'll be here all week, folks). This is a great travel story. Most, if not all, of us have been through some kind of road trauma or another. 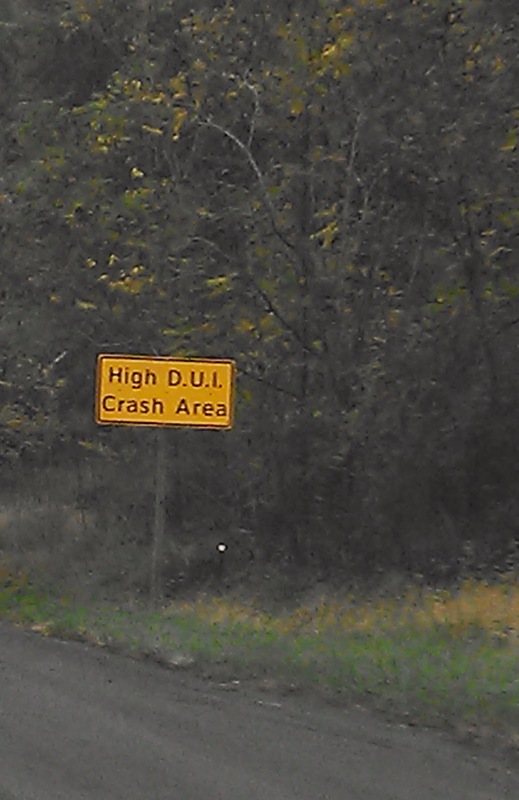 Living closer to PA, I have seen some of those signs that you posted. Some of them are quite amusing, the others...... Uhhhh yeah. Thanks for sharing your story as always ! !